This manual is for those people who are too lazy to read through the actual manuals of LibreCAD. Starting to Draw is an example that you can work thru alongside of this introduction. It should give a short introduction into LibreCAD. For further reading see further information. If you find some mistakes or find some steps not beeing explained well, you are encouraged to tell this on the forums of LibreCAD. To make clear what you have to type in the input line of the command line, the commands are in quotes. When you use/type the command, leave out the quotes. Some important regions of the main window can be seen in the following image. When drawing with the mouse, you just click on one of the icons from the cad/draw-toolbar and click with the left mouse button on the canvas. Undoing the last operation is done by pressing the right mouse button. The right mouse button as well as the Esc key can be used to end the draw procedure. To zoom you can spin the mouse wheel and to drag the canvas just press the mouse wheel and move the mouse. The steps to draw with your keyboard are the same as the steps taken while drawing with the mouse. The difference is, you have to type the commands/instructions into the command line. If you don't know what to do in the next step, when drawing, you may want to have a look at the comment in the command line. These are the options you will use the most when drawing. They allow you to create points, lines, ... .
To modify your drawing, either click on the drawing and move the points or use : “Modify” → “Edit Entity Geometry” or “Modify” → Edit Entity Attributes” Some modify options let you select the entities (lines, circles,...) you want to modify, to leave the selection mode and tell LibreCAD that you selected all you wanted press the button in the cadtoolbar (!!! one of the most overlooked steps !!!). "Draw" → "Line" → "2 Points"
As you may noticed, every time you create a new point, the “relative zero point” (⊕) is moved to the position of this point (if the option “Lock relative zero position” is disabled). You can use the relative zero point as the start point for the next point you want to create. To do that you have to type “@” before the coordinates of the next point. So “@60,70” would create a point which is placed 60 units in the x-direction and 70 units in the y-direction (from the position of the relative zero point). If you prefer the polar coordinates for drawing, use “LENGTH<ANGLEINDEGREE” to draw a line. Typing “30<45” will create a 30 units long line with an angle of 45° (from the absolute zero point). The “@” sign can be used here the same way. If you like to use weird unit you can use "line 1'10"<45 @60'4"<50" to draw a line. If you like to use weird unit you can use line 1'10"<45 @60'4"<50 to draw a line. If you want your drawing to be fitted on the page automatically and though don't mind in what aspect ratio it is printed, you can just hit the print button. To prevent some trouble in the print process, make sure that you set the paper format. To do that, you select “Edit → “Current Drawing Preferences” and click on the “Paper” tab. Here you should set the “Paper Format” to the size of your paper for example A4. To get more fancy prints, you should use the “Print Preview” button (or File → Print Preview). Here you can set the aspect ratio you would like and center the drawing to the page. Sometimes you want your drawing to be at a specific position. The position of your drawing on the page can be changed by clicking on the page (the white rectangle around your drawing) and moving it around. If your drawing has to be on an exact position you can draw a white (as printing white on white paper will make things disappear) rectangle, of the same size as your paper, around your drawing and selecting “Fit to page” in the “Print Preview”. “File” → “Save as” will do the job, if you want to save to the dxf format. If you want to show off your work to someone, who only can view .bmp files, don't worry there is also a way to save your drawing to a .bmp image. “File → “Export” will do the trick. Turn off “Restrict Horizontal” or “Restrict Vertical”. Uncheck the “fixed” check box. Turn off “Print Preview” mode. Hit the “Print Preview” button or uncheck “File” → “Print Preview”. Make sure the layer, where you applied the changes, is set to visible. There is a chance that In the directory where your file was saved. there is a file starting with “#”, for example “#myfile.dxf”. Just duplicate this file (copy & paste) and rename it as you like. This command may be implemented as a plugin and be only available in the main menu. Go to the LibreCAD forum and tell. There are also some videos about LibreCAD. 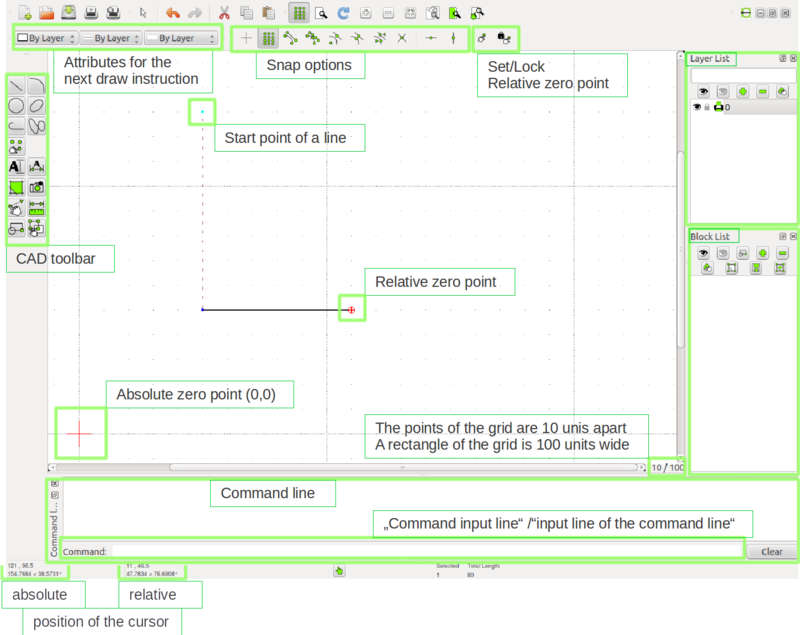 Tutorials/manuals can be found on the forum of LibreCAD. This page was last modified on 6 November 2018, at 11:21. This page has been accessed 111,627 times.